It's the now-Former Gnome in Chief, still looking very presidential in his dark suit, red striped tie and American flag lapel pin. 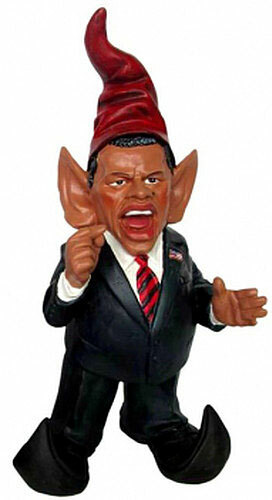 Our Barack Obama garden gnome is in full action, giving a passionate speech! Made from rugged weather-resistant cast stone resin, this 15-inch high statue will be addressing the crowds from your own rose garden long after his second term ends. This is the perfect gift for your politically-minded friends and family members, and is sure to delight or disgust the neighbors, depending upon which side of the fence they're on.